The act of constructing a wand or other ritual object is an act of magic. The magician spends an extraordinary amount of time creating ritual objects, not because it is only through these objects that magic can rightly be performed but because the act of creating is a magical process of growth, one which initiates the development of the will in accordance with the divine intent or purpose. This in turn contributes to the success of the ritual. The construction of a ritual object should be treated like any other magical operation. It should focus all parts of the magician's mind (intellect, creativity, imagination, spiritual self) onto one purpose – to manifest an object which will be a receptacle for higher forces, in order that the magician too can become a worthy receptacle of that which is divine. It is not necessary to create a perfect work of art. A person who works long and hard on a wand that looks crude will ultimately have more success than a person who purchases a ready-made wand that is flawless. With this book, clear instructions are finally available on how to fabricate the wands and implements of the Golden Dawn, some of the most significant, profound and beautiful of all the ritual tools that have ever been produced in the Western Magical Tradition. The various tools presented here each have a very specific symbology attached to them. With the materials and tools available to the modern magician, these instruments can be recreated with stunning accuracy and magnificence. Chic Cicero and Sandra Tabatha Cicero have been instrumental in preserving the mystical wisdom of the Hermetic Order of the Golden Dawn. Their Secrets of a Golden Dawn Temple: The Alchemy and Crafting of Magical Implements was the first book to bring you detailed instructions on crafting and using the ritual implements of the Golden Dawn system of magic. Now their classic text has been updated. 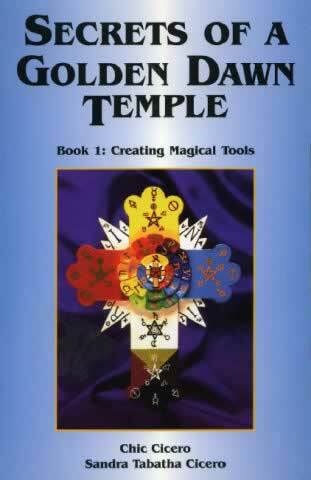 This is the most complete book to date on the construction of the many tools used in the Golden Dawn system of magic. Here is a unique compilation of the various tools of the Golden Dawn, all described in full: wands, swords, elemental tools, Enochian Tablets, altars, temple furniture, banners, pillars, thrones, lamens, mantles and robes, ritual headdresses and ceremonial clothing, admission badges, and much more. This book provides complete step-by-step instructions for the construction of nearly 80 different implements, all displayed in photographs or drawings, along with the exact symbolism behind each and every item. "Here is a superb do-it-yourself book that tells you every step to take in the construction of any GD wand, implement, or temple furnishing, complete with rituals. Constructing such implements from scratch is a spiritual path of its own." David Godwin, author of Godwin's Cabalistic Encyclopedia.